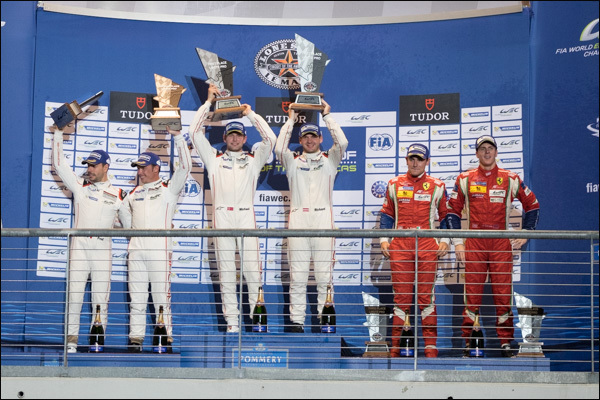 We noted earlier this year that the first two races of the 2015 FIA WEC were the best two 6 hour races ever, they still are! That’s not to say that this outing didn’t have moments of real quality, it most certainly did, but overall it was too messy to deserve the plaudits accorded to Silverstone and Spa. The weather was fabulous, a reasonable but not overly impressive crowd was there to see it and the start of the race seemed to promise a battle royal as Mark Webber elbowed his way by Neel Jani (not the easiest thing to do! ), behind the Audis and Toyotas squabbled allowing the Porsches to get away and that’s more or less the way it stayed until misfortune intervened for Toyota, Mike Conway losing the #2 car over the kerbs and hitting the barrier hard, the TS040 out on the spot, for Audi #8, a pitstop fumble with an air line pulling a wheel from a mechanic’s grasp, a 1 minute stop go the result, and then for Porsche, the #17 got a 60 second stop and hold for a pitstop infringement , with Mark Webber comprehensively overshooting his pit on a routine stop a little later costing the team a further 30 seconds or so. That could have been the decisive moment had it not been for the major electrical issue that hit the sister #18 car, then leading the race convincingly. Audi seemed to sense some looming issue for Porsche and had started to push before the #18 was garaged until the final lap. It wasn’t going to be enough though without another issue for the #17 and Brendon Hartley drove a controlled final stint to bring it home 66 seconds clear of the #7 with the #8 just lapped, not so very far away from the gap extended by that 60 second stop-go! The surviving Toyota came home 2 laps down after a fighting attempt at getting amongst the podium contenders fell short on pace, and a fumble from Ant Davidson who missed the pit entry and almost ran out of fuel in getting around again didn’t help matters! Add the extra time taken to complete the lap in fuel saving mode and a later stop go penalty and it COULD have cost Toyota a podium! 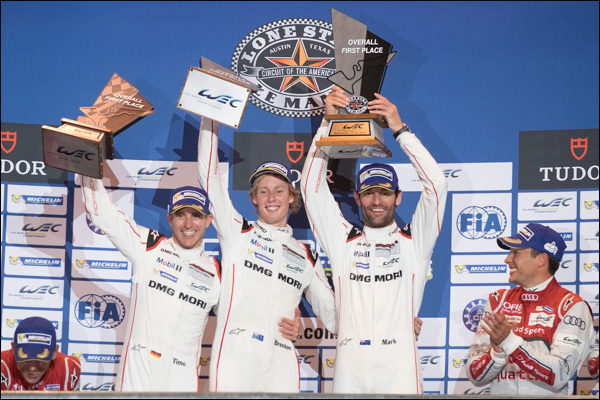 In LMP1 Privateer the ByKolles CLM took a second consecutive win for Simon Trummer and Pierre Kaffer after both Rebellion AERs again suffered electrical niggles. It closes up the points battle, but the class could do with all three cars running fast and clean. 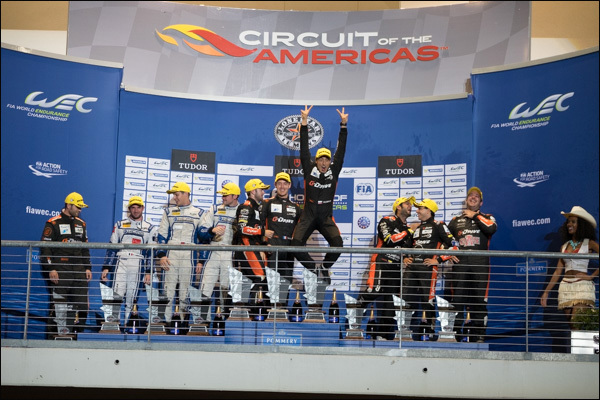 LMP2 was very entertaining for large portions of the race. Whilst the Signatech Alpine and #30 Tequila Patron ESM Ligier HPD in the hands of Ryan Dalziel) would both lead, and on pace at that, the regular pacesetting trio would end up contesting the win. Before that though there was a frightening shunt at the final corner for Ed Brown in the #31 ESM Ligier, the car losing its brakes at T19 and arriving at T20 at way too high a speed, launching over the inside kerb and getting airborne, Brown fortunate that the car stayed upright before hitting the outside barrier hard, he was OK, the #31rather less so! There were some fine midfield battles too with the #43 SARD Morand Morgan Judd and Strakka’s Gibson in the mix for periods in the race, Oliver Webb impressive in the #43, Danny Watts in the #42. The Morgan, Alpine and #30 Ligier would be battling hard to the very end of the race, the trio crossing the line almost three wide with Dalziel crossing the line just ahead to grab fourth, the trio separated by just 8 tenths of a second at the flag. Ahead there was a relatively lonely run to the flag from the #28 G-Drive Ligier Nissan, 22 seconds ahead of the battle for 4th for the Latin-American crewed JS P2. KCMG started from the back of the grid after a penalty in qualifying but before the first hour was up they led, there would be no Nurburgring-like dominance this time out though, Richard Bradley’s early pace looked ominous but the team didn’t sustain the attack and were another outfit to get a pitlane penalty, this eventually ending their pursuit of the eventual race winning #26 G-Drive Ligier Nissan, a result which opens up the Championship once again. Sam Bird was excellent for the #26 crew with Julien Canal again showing that driver rankings can tell a bewitching tale. Roman Rusinov’s broad smile showing that this was was much a relief as a joy after recent drubbings at the hands of the Oreca. In GTE Pro there was effectively a rout of the opposition by the Porsche pair, #91 & #92 moving to the lead after early race pace faded from the Aston Martins and never looking back. The pair mounted as convincing a 6 hour formation run as this writer has ever seen, usually less than 2 seconds apart with the final result seeing maximum constructor points and the #91 car taking the top step and extending Richard Lietz’s Drivers Championship lead. Behind them it was another disaster for the #51 AF Corse Ferrari, a broken door catch, u/s lighted number panel and the team ignoring the ‘meatball’ technical warning flag too long causing them too long in the pits and then a penalty to mount any kind of push in this company- another seventh place finish sees them drop back in the points. It was the sister car again that saved the Ferrari day, James Calado and Davide Rigon mounting a fine run that was good enough to dispense with the Aston Martin threat but wasn’t enough to have an answer for the Porsches. The #99 was the best of the Aston trio that seemed to wilt in the heat, early pace fading very rapidly. GTE AM was, without doubt, where the best racing of the day was to be found. The #50 Corvette ran well at the start of the race in the hands of Paulo Ruberti but faded thereafter, including it’s now traditional couple of on-track contacts. The #96 Aston Martin was another car to run well up only to fall back, this despite convincing efforts from all three drivers, Stuart Hall charged hard, and team debutant Benny Simonsen showed why they’d chosen to pick his name out of the Rolodex! The #98 Aston had a scrappy sort of race and was never really in contention for the win the team sorely needed. That left four contenders, a pair of Porsches, and a pair of Ferraris. Three of the four would lead at some point with Pat Long starting the race at a pace, getting well amongst the Pro cars and handing over a handy advantage to Patrick Dempsey. Dempsey would drive very well, likely his best stint at this level thus far, but would eventually cede the lead to Rui Aguas in the #82 AF Corse Ferrari who had taken over from Manu Collard. That lead was well defended by Francois Perrodo but he was eventually unable to resist the charge from Earl Bamber, the #88 Abu Dhabi Proton Porsche another back row starter. Through all of this though there was another car making steady progress, and into the final hour the Championship leading #72 SMP Racing Ferrari made its move into the class lead, all three drivers again showing their class and delivering a third consecutive class win – They are beginning to look very tough to beat with a 35 point lead over the #83 Ferrari crew, 50 over the once dominant #98 Aston.